Don and I left The Villages around 10 am on Sunday, after packing up our villa. We did leave a number of bags and boxes at Ray and Linda’s home, including cold weather clothing we won’t be needing for the next weeks. Don will retrieve those after he drops me off in Fort Lauderdale and heads back to Indy. 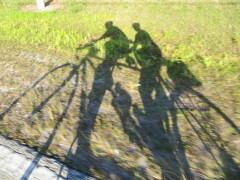 We headed to St. Petersburg to visit Ian and Cheryl, tandem friends from Indiana. 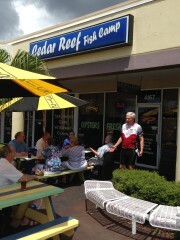 They took us on a bicycle tour of the St. Pete Beach area, parts of it quite busy on Easter Sunday. 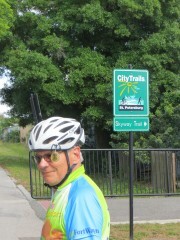 We were on the Pinellas Trail, the Treasure Island Causeway Trail, the St. Pete Beach Trail, the Bayway Trail and the Skyway Trail, a total of 26.12 miles (http://old.stpete.org/transportation/citytrails/docs/bikemap2014.pdf). 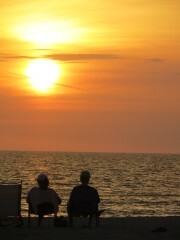 Then we enjoyed dinner at Fish Tales before driving down to Venice to spend three nights. 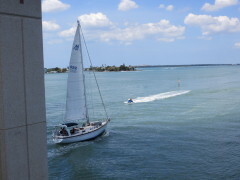 The sailboat motored under the open bridge. Using a bicycle lawn mower to cut the artificial grass? 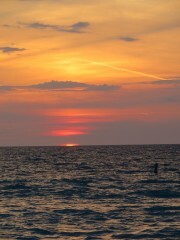 We stopped at the beach and walked out on the jetty. 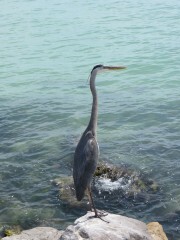 The blue heron was supervising the fishing on the jetty. Don tried to pick up this bikini-clad young lady! 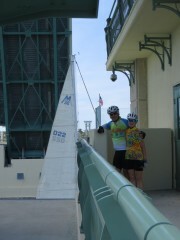 Ian and Cheryl on the Bayway. 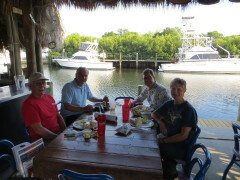 Dinner at Fish Tales on the water. When we got to Venice, I contacted Nancy Howard who had been on CCST13, regretfully ending the tour early in New Mexico when she fell and broke her shoulder. 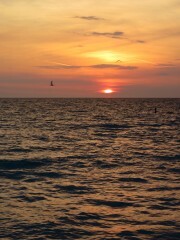 She is healed now and in Venice training for the Atlantic Coast tour. 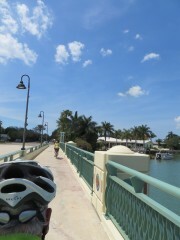 We met Monday morning and headed out on the Legacy Trail and the Venetian Waterway Trail. 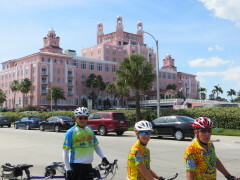 I suggested we take an “adventure ride”, following Dan Henrys (road markings) from the CIBA Boot Camp in March. 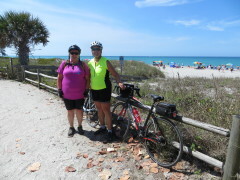 We headed to Manasota Key, riding from Manasota Beach south to Englewood Beach. Nancy was excited to “Dolly-gag” after several weeks of just riding around Venice. 39.88 miles on my single. Dolly-gagging includes reading historical markers! 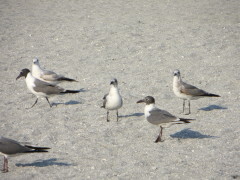 Along Manasota Key – cross-breeding?? 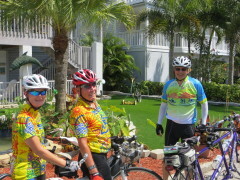 Beautiful beach & biking friends! 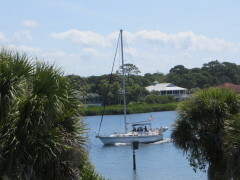 Sailboat in the Intercoastal Waterway. 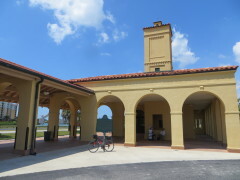 Train depot along the Legacy Trail, used as a bus station as well. 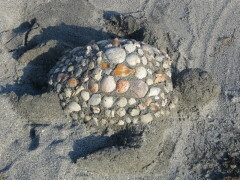 Instead of a sand castle, someone created a sand turtle. 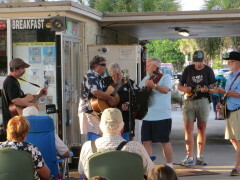 Beach entertainment while we waited for the sunset. 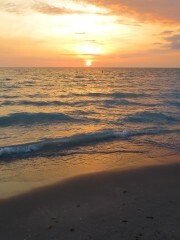 No sizzle as the sun hit the water. 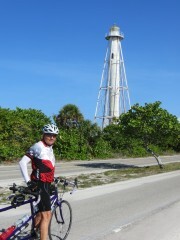 Today, Don and I got up early and headed south to Englewood to ride down to Gasparilla Island. Again, this is a route we have ridden before at CIBA Boot Camp. 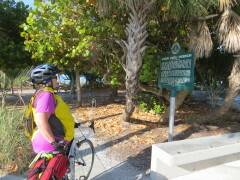 Thanks to a AAA map of the area, we “created” our own route through Rotunda (http://www.rotondawest.org), then crossed the three bridges to get to Gasparilla Island, continuing on to Boca Grande. 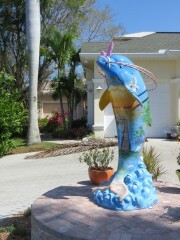 We found some new roads on the Island we had not explored before, and lots of beautiful homes. 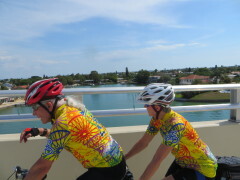 40.82 miles on the tandem. Delicious lunch at the Cedar Reef Fish Camp and now a quiet evening. 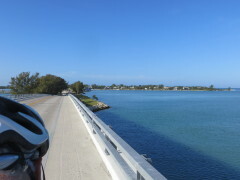 Along one of the causeways to Gasparilla Island. Bougainvillas are in bloom. 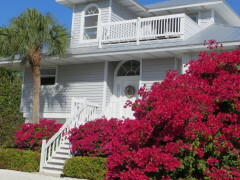 This beautiful home is For Sale, no info on price. Old lighthouse on the Island. 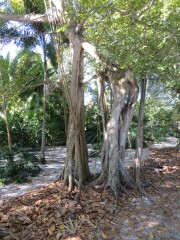 One of the smaller banyan trees we saw. 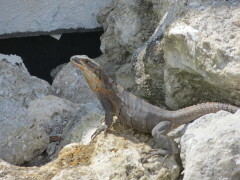 This fellow was blocking our entry to the Cape Haze Trail. Yummy lunch at the Cedar Reef Fish Camp. What a GREAT adventure you are having! So lovely. How are the bugs? A great post, Dolly. Have fun.